The HFI is the most comprehensive freedom index so far created for a globally meaningful set of countries. The HFI covers 159 countries for 2015, the most recent year for which sufficient data are available. The index ranks countries beginning in 2008, the earliest year for which a robust enough index could be produced. On a scale of 0 to 10, where 10 represents more freedom, the average human freedom rating for 159 countries in 2015 was 6.93. 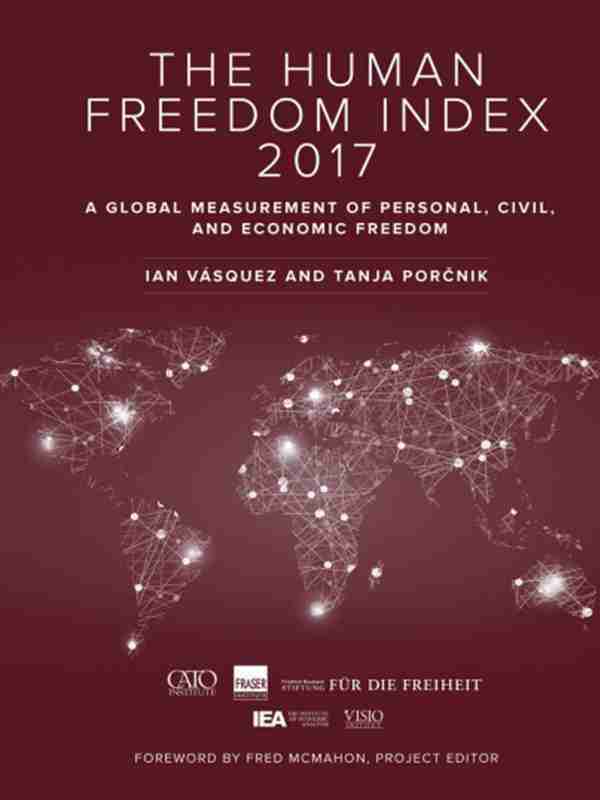 Among countries included in this report, the level of freedom decreased slightly (-0.05) compared with 2014, with 61 countries increasing their ratings and 97 decreasing. Since 2008, the level of global freedom has also decreased slightly (-0.12), with about half of the countries in the index increasing their ratings and half decreasing. The top 10 jurisdictions in order were Switzerland, Hong Kong, New Zealand, Ireland, Australia, Finland, Norway, Denmark, and, tied at 9th place, the Netherlands, and the United Kingdom. Selected countries rank as follows: Canada (11), Sweden (13), Germany (16), the United States (17), Japan (27), South Korea (29), France (33), Italy (35), Chile (37), South Africa (68), Mexico (73), Indonesia (78), Turkey (84), Kenya (89), Malaysia (97), India (102), United Arab Emirates (116), Russia (126), China (130), Nigeria (133), Pakistan (141), Zimbabwe (146), Saudi Arabia (149), Iran (154), Egypt (155), Venezuela (158), and Syria (159). Out of 17 regions, the highest levels of freedom are in Western Europe, Northern Europe, and North America (Canada and the United States). The lowest levels are in the Middle East and North Africa, Eastern Europe (Moldova, Russia, and Ukraine), South Asia, and sub-Saharan Africa. Women-specific freedoms, as measured by seven indicators in the index, are strongest in five European regions (Central Europe and the Baltics, Western Europe, Northern Europe, Eastern Europe and Southern Europe) and North America and are least protected in the Middle East and North Africa, South Asia, and sub-Saharan Africa. Countries in the top quartile of freedom enjoy a significantly higher per capita income ($38,871) than those in other quartiles; the per capita income in the least-free quartile is $10,346. The HFI finds a strong correlation between human freedom and democracy. Hong Kong is an outlier in this regard.